Kapteeni Ahonius in front of IT-16 at Römpöti on 9 July 1942. Per-Erik Ahonius was born in Soulahti on 6 May 1912. He received flying training in 1932-33 at IRUK 2 and was accepted to KadK on 31 May 1935. He was placed at Las 2 and on 30 April 1938, he was promoted to luutnantti. He was transferred to Er.LLv on 22 February 1940. On 9 December 1941, he was promoted to kapteeni. Kapteeni Ahonius took over command of 3/LLv 6 on 30 December 1941. The unit was at this time based at Malmi airport and equipped with three Polikarpov I-153s. On 13 January 1942, 3/LLv 6 moved to a field near Hamina. This field was made on the frozen sea in order to support the army in the seizing of the outer islands in the Gulf of Finland. 3/LeLv 6 moved to the neighbourhood of Kotka to an ice-field base on 19 March. On 23 April, 3/LLv 6 returned to Malmi airport. On 27 May, 3/LeLv 6 moved to Römpötti on the Karelian Isthmus with the task of patrolling the eastern parts of the Gulf of Finland. On 22 June, a patrol led by kapteeni Ahonius sighted several coast guard motorboats near Seiskari. Two of them were shot alight. Another coast guard vessel was destroyed east of Lavansaari. Next day on 23 June, another patrol lead by kapteeni Ahonius destroyed another motorboat by shooting it alight. “At 22:50 I observed a dust cloud appearing on the shore of Seiskari and flew there. Three apparently I-16s were taking off from the sandy beach. I shot at the middle aircraft, which instantly caught fire and remained on the shore burning. The first machine had become airborne. I began now firing at it and when it curved to the port, it soon caught fire, when I was able to shoot from the side at a 50m distance and it went into the sea. The third one about to take off either stopped there or managed to slip and hide to starboard. On 5 July, kapteeni Ahonius’ pair of 3/LeLv 6 shot a patrol motorboat into flames near the Shepelevskiy lighthouse. 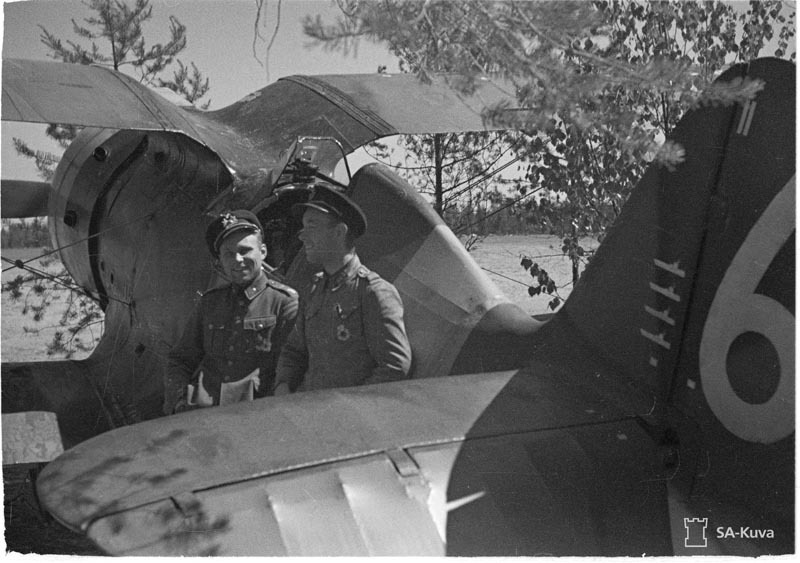 Kapteeni Ahonius and vänrikki Johannes Niemeier (left) in front of IT-16 at Römpöti on 9 July 1942. On 10 July, followed to liaison command to LaatRPr. On 6 November, he took command of 1/LeLv 6. On 16 November, 3/LeLv 6 was assigned to LeLv 30 to form its 2nd Flight. Lentorykmenti 5 (LeR 5) was founded on 4 November 1942 and assigned to the Naval Headquarters. It was under the command of Lieutenant-Colonel K. Ilanko. Two squadrons were assigned to LeR 5. They were LeLv 6 with its bombers and reconnaissance aircraft and LeLv 30 with its fighters. On 16 November the I-153 flight of LeLv 6 became the 2nd Flight of LeLv 30. LeLv 30 was under the command of majuri Eino Luukkanen and based at Römpöti. The 1st Flight was under the command of kapteeni Ahonius and equipped with 6 Fokker D.XXIs at Römpötti. 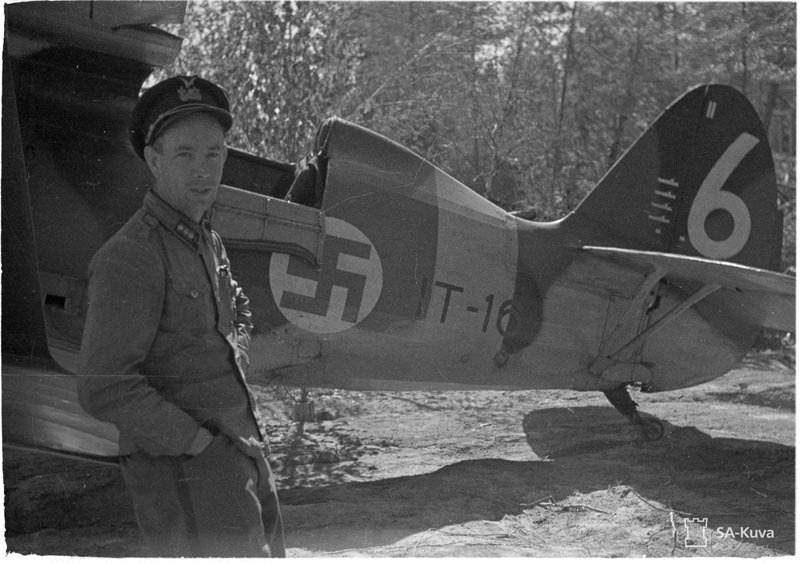 The 2nd Flight was under the command of luutnantti R. Paltila and equipped with four I-153s at Römpöti. In early 1943, the 1/LeLv 30 had four Fokker D.XXIs and 2/LeLv 30 had three I-153s. Ahonius ended the war with 2 biplane victories. During his career, he was awarded with the Vapauden Risti of the 3rd and 4th Classes. On 3 December 1944, he was sent to reserves. Ahonius died on 17 January 1995. Biplane victories: 2 destroyed, 1 shared destroyed patrol motorboat on the water. TOTAL: 2 destroyed, 1 shared destroyed patrol motorboat on the water.